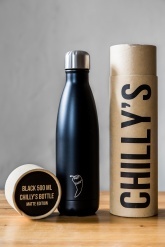 The Chilly’s Bottle is a revolutionary reusable bottle that can keep your water ice cold for up to 24 hours or will alternatively keep contents hot for up to 12 hours. The design of the Chilly’s Bottle fits perfectly into your lifestyle, whether you’re on the morning commute, in the office or on the beach. Using advanced double-wall vacuum technology, the Chilly's Bottle is able to keep your water ice-cold for up to 24 hours - whatever the weather. The idea for the Chilly’s Bottle was to launch a product that combines the convenience of a plastic water bottle, with the high performance technology and eco-friendly benefits of a traditional flask. The result is a reusable water bottle that offers outstanding performance in a modern and stylish design, that people love to have with them at all times. Chilly’s is a London based business, founded in 2010 and run by James Butterfield and Tim Bouscarle.